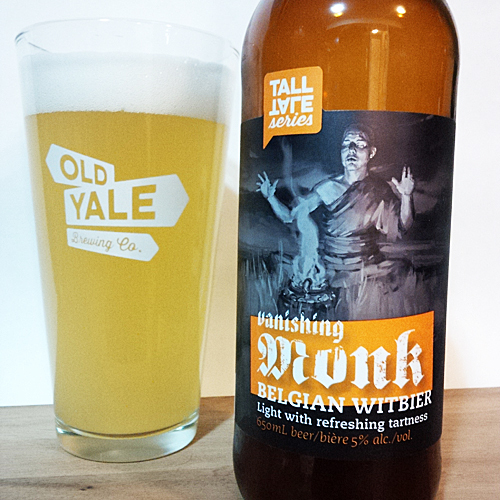 Old Yale Brewing Vanishing Monk Belgian Witbier: I received this beer as a part of a solicited review sample pack where the brewer has offered me a sample of beer and asked me to review it. Vanishing Monk is a Belgian Witbier that is brewed in Chilliwack, BC to a strength of 5% abv with a Pilsen and flaked wheat malt base accompanied by 20 IBUs worth of Hersbrucker hops. As a part of their Tall Tale series, this release comes in a 650mL bottle that includes a short story of the “Vanishing Monk” on the right side of the label. Regarding the style, Witbiers are intentionally cloudy and are known to have a slight tartness to them which can vary depending on the amount of wheat used in the mashing process. Aroma and Appearance: As pictured above, this pours a cloudy yellow colour with two small fingers of white foam and some hidden carbonation. Its aroma features lemon tartness, wheat, grains and a general yeasty scent that is detectable from quite a distance. Flavour: It tastes quite yeasty upfront and quickly transitions into some wheat malts, oats and subtle lemon flavours in the middle of the beer. Near the finish, the tartness from the wheat appears along with some slight floral and herbal hop notes, with cereal grains and wheat texture on the aftertaste and mouth feel. 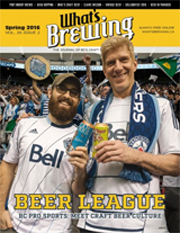 Overall Impression: Fairly similar to an American wheat beer, the slight tartness sets it apart and makes this a good spring release beer that will pair well with a sunny patio or outdoor picnic. These beers are intended to be consumed as fresh as possible, so don’t wait too long on this one before cracking it open. 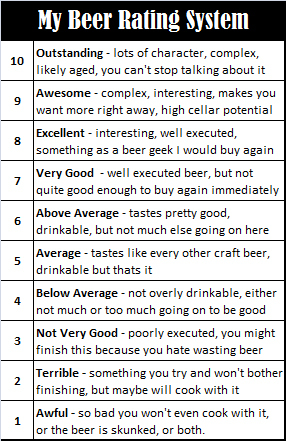 Rating: Since this is a solicited review where the beer was sent to me specifically for a review, I won’t be providing an official rating on this beer but rather will focus on the tasting notes only. Food Pairing: They give some neat suggestions on the bottle for food pairings, recommending to use this to steam muscles which sounds fantastic or to pair it with a fruit salad. I am going to try it with some creamy brie or similar cheese in the near future as I think it would match up quite nicely with something local. Here’s a link to their Facebook Page release of this beer, giving you their commercial description, their tasting notes and some other food pairing suggestions.